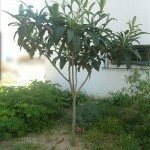 How many times a year do loquat trees produce fruit? It's Oct. and it looks like it is doing it again. Thanks. Loquat trees normally only flower once a year. It is unusual because it produces its flowers in the fall, and the flowers develop into fruits which can be harvested in spring. This is probably the behavior you're observing.